Ornave, Ornavy, Ornavee – our customers sometimes find our name confusing. As well as spelling and pronunciation issues, from time to time we also get asked “Why the name Ornavi?” or “What does it mean?”. Besides us thinking it had a nice ring to it, there’s more to this name than meets the eye…. This may seem blindingly obvious, but when you start any new venture, especially in this digital world, it’s important to get the name right. Apart from being snappy, ideally you want to be unique. It makes life easier when it comes to securing the appropriate domain(s), social media handles, not to mention attaining better organic search results. But beyond this, we wanted something with real meaning that we could be proud of. After much research we uncovered Ornavi. 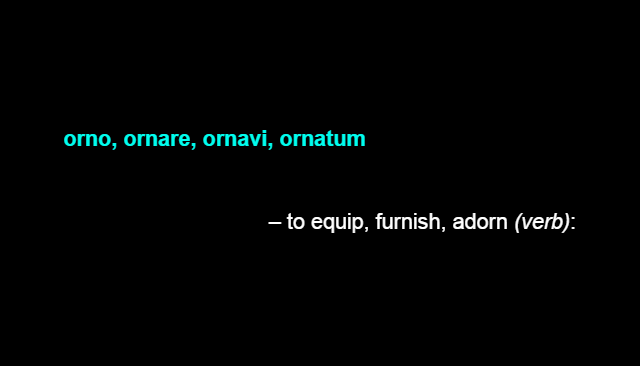 Ornavi is from a family of Latin verbs which mean “to equip, furnish or adorn”. It was a perfect fit because that’s exactly what we want to do, equip, furnish and adorn you with all the business information and tools you require to make educated and informed decisions that maximise the potential of your business. In other words, bring it all together in one place. So you still might not know the meaning of life, but now you do know the meaning of Ornavi. Enjoyed this article, then you will love this one – learn how household brands like Google and Coca Cola got their names.